• A MINI-PRIMER OF "BOUNDARY CRITIQUE"
Abstract "Critical Systems Heuristics," also just called "Critical Heuristics" or "CSH," is a framework for reflective practice based on practical philosophy and systems thinking. 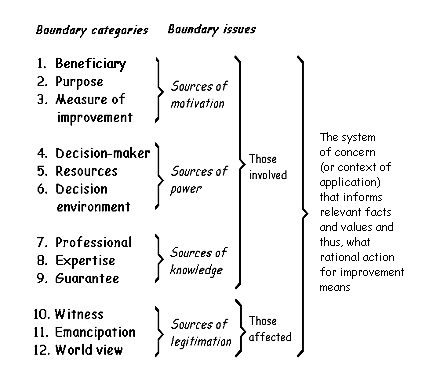 The basic idea of CSH is to support boundary critique – a systematic effort of handling boundary judgments critically. Boundary judgments determine which empirical observations and value considerations count as relevant and which others are left out or are considered less important. Because they condition both "facts" and "values," boundary judgments play an essential role when it comes to assessing the meaning and merits of a claim. Their systematic discussion can help bridge differences of perspectives across disciplines and between experts and non-experts. They also lend themselves to a specific critical employment, called emancipatory boundary critique, against claims that do not uncover their underlying boundary assumptions. CSH can thus serve as a tool for coproducing knowledge as well as for critical and emancipatory purposes on the part of people concerned by, but not necessarily involved in, the definition of relevant facts and values. Critical systems heuristics (Ulrich 1983) represents the first systematic attempt at providing both a philosophical foundation and a practical framework for critical systems thinking. The Greek verb heurisk-ein means to find or to discover; heuristics is the art (or practice) of discovery. In management science and other applied disciplines, heuristic procedures serve to identify and explore relevant problem aspects, questions, or solution strategies, in distinction to deductive (algorithmic) procedures, which serve to solve problems that are logically and mathematically well defined. Professional practice cannot do without heuristics, as it usually starts from ‘soft’ (ill-defined, qualitative) issues such as what is the problem to be solved and what kind of change would represent an improvement. A critical approach is required since there is no single right way to decide such issues; answers will depend on personal interests and views, value assumptions, and so on. A critical approach does not yield any single right answers either; but it can support processes of reflection and debate about alternative assumptions. Sound professional practice is critical practice. CSH aims to support reflective professional practice through a critical employment of the systems idea. The methodological core idea is that all problem definitions, proposals for improvement, and evaluations of outcomes depend on prior judgments about the relevant whole system to be looked at. Improvement, for instance, is an eminently systemic concept, for unless it is defined with reference to the entire relevant system, suboptimization will occur. CSH calls these underpinning judgments boundary judgments, as they define the boundaries of the reference system (the situation or context considered relevant) to which a proposition refers and for which it is valid. To challenge in a compelling way any claims to knowledge, rationality, or ‘improvement’ that rely on hidden boundary judgments or take them for granted. The first two applications are basic for dealing with multiple perspectives in basically cooperative settings. They can help people understand why in respect to one and the same situation, their considerations of "fact" and "value" differ. They can thus help to bridge such differences or at least, to promote mutual understanding and cooperation in handling them. The third application, by contrast, leads to an emancipatory employment of systems thinking called emancipatory boundary critique. It offers both those involved in and those affected by professional practice an opportunity to develop a new kind of critical competence, a competence that will not depend on any special theoretical knowledge or expertise with respect to the problem or situation in question that would reach beyond what is available to ordinary citizens. In short, CSH can be defined as a critical methodology for identifying and debating boundary judgments. Unlike the mainstream concept of reflective practice (Schön 1983), CSH focuses on the normative core of all claims to relevant knowledge, rational action, and resulting improvement. Despite its emancipatory implications (the aspect for which it is best known), CSH should not, however, be misunderstood and used as an emancipatory systems approach only; for its methodological core principle of systematic boundary critique is vital for sound professional practice in general, whatever importance may be attached to emancipatory issues. For the same reason, CSH does not aim to be a self-contained systems methodology but is better understood as an approach that should inform all applied research and professional practice, whatever specific methodology is used. Summary The boundary judgments by which we delimit situations of concern, whether consciously or not, are crucial for what counts as relevant knowledge and adequate values. Critical systems heuristics (CSH) is a framework for reflective practice, grounded in practical philosophy and critical systems thinking, that focuses on the systematic examination and discussion of such contextual assumptions and the multiple perspectives they inform. As they condition people's views and concerns regardless of the kind and amount of special expertise they may have, CSH is apt to support cooperation across disciplinary borders as well as between experts and non-experts or among different groups of stakeholders. On the one hand, it provides a common language and relevant form of critical thought for diverse forms and settings of inter- and transdisciplinary research and professional practice. On the other hand, it also offers a model of rational critique that can be used for emancipatory purposes in not so cooperative settings, against claims (or people) who do not handle their boundary judgments quite so critically. In sum, CSH provides researchers and professionals with a new and important kind of research competenc, and at the same time is apt to offer citizens concerned by their claims a new kind of competence in citizenship (see Ulrich 2001 and 2017). Schön, D.A. (1983). The Reflective Practitioner: How Professionals Think in Action. New York: Basic Books. Ulrich, W. (1983). Critical Heuristics of Social Planning: A New Approach to Practical Philosophy. Bern: Haupt. Reprint edition, Chichester: Wiley 1994. Ulrich, W. (1987). Critical heuristics of social systems design. European Journal of Operational Research 31(3), 276-283. Ulrich, W. (2000). Reflective practice in the civil society: the contribution of critically systemic thinking. Reflective Practice 1(2), 247-268. Ulrich, W. (2001). The quest for competence in systemic research and practice. Systems Research and Behavioral Science, 18, No. 1, pp. 3-28. Ulrich, W. (2005). A brief introduction to critical systems heuristics (CSH). ECOSENSUS Publications, Knowledge Media Institute (KMI), The Open University, Milton Keynes, UK, 14 October 2005. Ulrich, W. (2017). If systems thinking is the answer, what is the question? Discussions on research competence. Ulrich's Bimonthly, May-June 2017 (Part 1) and July-August 2017 (Part 2). Source: Adopted from: W. Ulrich, "Critical Systems Heuristics," in: The Informed Student Guide to Management Science, ed. by H.G. Daellenbach and R.L. Flood, London: Thomson Learning, 2002, p. 72f. Copyright: © 2001 W. Ulrich and © 2002 Thomson Ltd (original version), © 2005 and 2018 (present version). All rights reserved. Noncommercial distribution and citation permitted on the condition that proper reference is given. Suggested citation: Ulrich, W. (2005). A mini-primer of critical systems heuristics. Rev. version of "Critical systems heuristics," in H.G. Daellenbach and R.L. Flood (eds. ), The Informed Student Guide to Management Science, London: Thomson Learning, 2002, p. 72f. Expanded version in Werner Ulrich's Home Page, http://wulrich.com/csh.html, first published 17 October 2005, last updated 30 April 2018.